Our heating has only been on once since about March, and that was only because I didn’t wash uniforms early enough and the school jumpers, which shrink just waving them in front of the tumble drier, were still wet one Sunday night. Yes it was lovely to wake up in a toasty warm house, but we were all groggy and too snuggly to even want to get out of bed, so counter-productive in my eyes! Some friends, and family, are always bemused to hear that our heating is rarely on even in the middle of winter, unless we have a small baby in the house, and can’t understand how we haven’t all frozen to death yet. 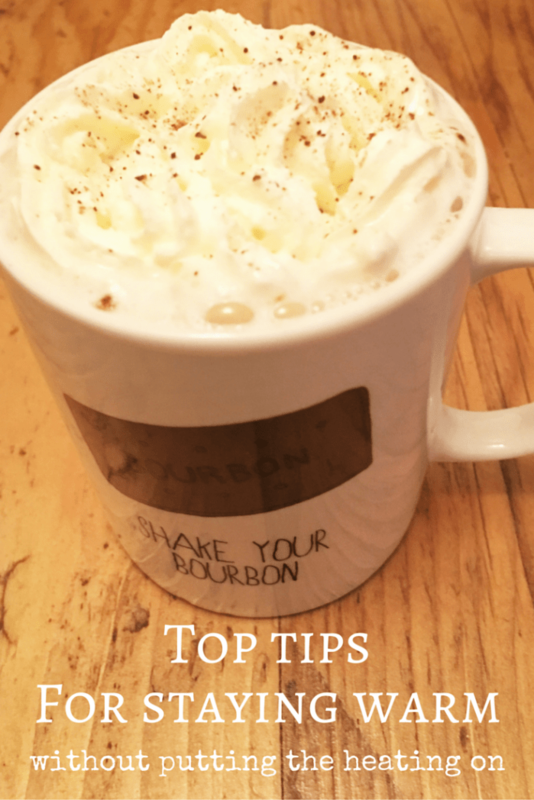 But with rising energy costs, doubled with the cutting of tax credits and benefits I know a lot of people will start to feel the pinch soon so I thought I would share some of my simple, yet effective tips to staying warm. Layer up. If you own vests wear them other wise use a strappy top/vest style top to act like a vest. Put a long sleeved top on under your tshirt. Wear a jumper/cardi. If you’re really cold you could even put your dressing gown on too, although if it’s that cold I would maybe try step two first. Keep active. Forget spring cleaning, winter is the best time to get about doing a deep clean of the house, even if it’s just to stay warm. Sitting down doing nothing is a sure fire way to letting the cold creep into your bones. If you work form home and have to sit down, get up every hour to move around, run (literally run) some bits up and down the stairs that need putting away/moving just to get the blood pumping a bit. Dig out the blankets. In the evening when you want to relax, or if you need to sit for extended periods during the day try covering yourself with a blanket, even just the throw from the sofa will do. If you don’t have any spare throws/blankets drag the duvet off your bed, at least it will still be warm at bedtime. Hot drinks. There has been some science behind the fact that drinking cold drinks can trick your body into raising your internal body temperature. But you have to admit that just the act of holding a scalding cup in your hands, feeling the steam tickle your nose, then sipping and feeling the hot liquid trickle down your throat makes you feel nice and snuggly. Let’s be hones, even reading about it makes you warm up! hot water bottle. Now is the perfect time to dig out your hot water bottles and give them a quick check over before they get plenty of use. Remember they are not only useful at bedtime mind! cover your feet. Putting on socks and slippers can go a long way to making you feel warmer, especially if you have hard floors like we do. There’s nothing worse than standing on freezing cold floor tiles in your bare feet first thing in the morning. go out for a walk. If it is freezing cold outside getting out and about will not only warm you up from being active, but, unless you are really unlucky and your house is really draughty, it should feel warmer when you get back inside. Keep the curtains shut and tucked behind the radiators. A lot of heat escapes from your windows so it makes sense to keep them covered and what heat you do have inside staying inside. If you do have the heating on, keeping your curtains tucked behind the radiator will stop all that precious heat from escaping behind them. Keep your curtains open. Yes I know I just told you to keep them shut but bear with me. If it is a really sunny day, letting the sun shine in through your windows can really warm the room up. Just remember to shut them again when it goes away and before all that heat disappears again! Eat something warm, stodgy and comforting. There’s nothing better for staying warm on a cold day than sitting down to a nice hot bowl of soup, stew, casserole etc. But remember that spicy foods, like curry and those containing chillies and cayenne pepper will warm you up as well. Ginger is supposed to be good too, so there is a good excuse to whip up a batch of gingerbread! Block out draughts. Use a draught excluder (or a rolled up blanket) at the bottom of the doors, on letterboxes and keyholes. putting blankets over your bedroom curtains and making sure you don’t have any gaps between floorboards can all help keep the warmth in and the cold out. Take advantage of the oven. Stand by the oven whilst your cooking in preparation for tip 10. Leaving the door open after your done will also let the warmth that you’ve already paid for spread through the kitchen. So those are my 12 tips to staying warm without putting the heating on, what would you add to the list? and just a little something to make you smile. Considering he can’t eat dairy I doubt we’ll have a fun night, but at this precise moment I bet he’d say it was all worth it! Trying to take a photo of hot chocolate for tonight's blog post when this happens! I’m ALWAYS freezing cold (although I think I may have raynauds) but R is always warm! We have leather sofas atm and that definitely doesn’t help. I always have a blanket and drink plenty of tea of though! We are starting to have more comfort food now the weather is getting so nippy too. I really need one of those draught excluders (or a few) and thicker curtains. I’m even considering door curtains! Need to remember that about the oven – sometimes I leave our airing cupboard door open too! Ps, Hope the hot chocolate didn’t result in too much of a mess! These are really good ideas Katie! Especially putting the curtains behind the radiators… why have I never thought of this?! Mini Travellers recently posted…Family Holiday in France – To Ferry or To Fly? Great tips! I love layering up and putting slippers on – it’s the best part of winter, which is the best season of all! Great ideas! The weather has just turned cool here in Canada and we’ve begun drinking hot chocolate at breakfast and bedtime. The hat also went on the other night because the temperature dropped bellowed 0 degrees. Brr….. Some nearby areas had snow last night- I guess it won’t be long before we need mittens and hats! Thanks for your tips. I may use a few today! I love in India which is basically a warm country but in extereme winters temperature can go to freezing level and it is very difficult to deal with the situation ( don’t laugh, I know in some countries temperature drop even to -20 ). The tips you’ve mentioned are really effective and we try most of them at home. Other than this, we have made our home well insulated and this is really helpful in keeping the warmth of house inside and in preventing outside cold winds entering inside. The real challenge starts when you’ve to step outside. I love winter! Thanks for your advises!